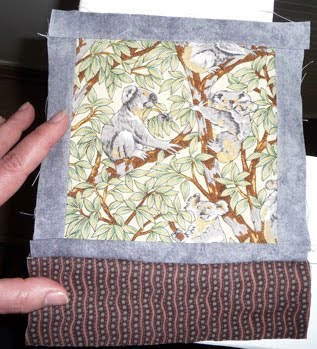 Then I stitched strips to the tops and bottoms, completing the "frames" for the koalas. That makes it all go a lot faster. 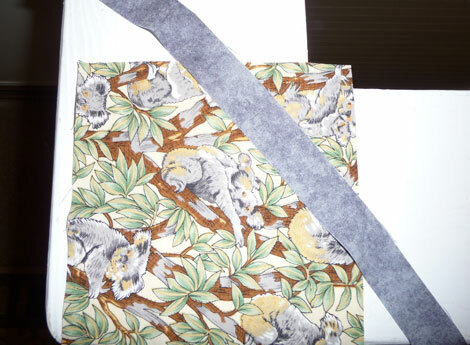 The sashing fabric is a brown aboriginal print. It's very attractive, perfectly compliments the colours in the koala fabric, and looks a bit like bark - so I'm going to make sure that the lines in the sashing fabric run vertically (to maximize the bark-like effect). 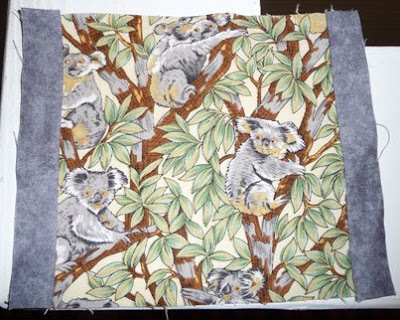 and then put the sets together to form a strip of koala blocks. 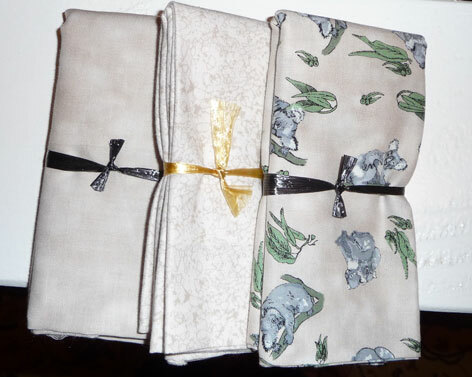 It's important that the koala's are all going in the same direction (a one-way print). 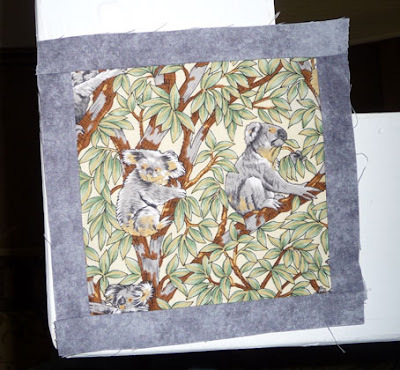 By sewing the horizontal sashing only on the bottom of the koala blocks, I eliminated the chance that I'd get them turned to the side or upside down. ...and now the vertical strips are done. Done! From start to finish, it took just 5 hours to get this much done. 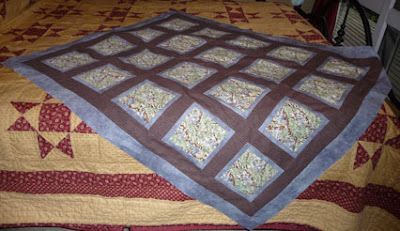 I would have liked the grey border to be wider, but if I'd done that, it would have been too wide for the special "baby quilt batting" that I bought. 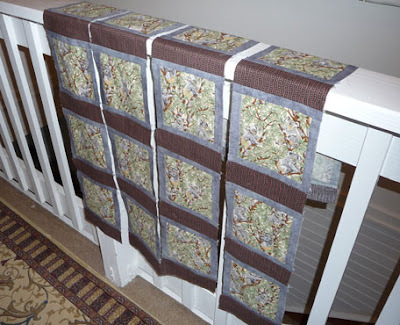 The batting is 45x60 (inches), so I was somewhat limited by that. Still - it's a good size for the purpose. 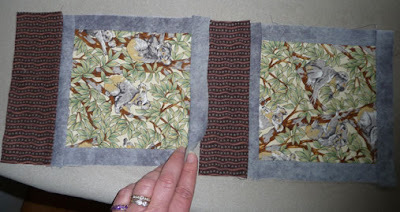 All ready to make up the "sandwich" and then the quilting can begin. 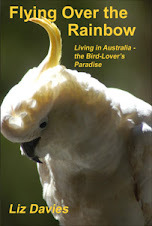 I came to Australia 4 years ago as an immigrant. I'm so glad I had this opportunity and am very grateful to the many wonderful people who have been so kind, helping me along the way. I'd like to name them all here, but there are too many to name. And not just my beautiful Australian family and friends, but those back in Ohio who supported my decision (even though they didn't really understand). And - as of November 12, I became eligible to apply for citizenship. I took that step on the day. There's a citizenship test I have to pass (and I'm studying hard) and then waiting to be notified when and where I will participate in a citizenship ceremony. For we are young and free..."
I love these fresh white-and-green "Irish" prints. 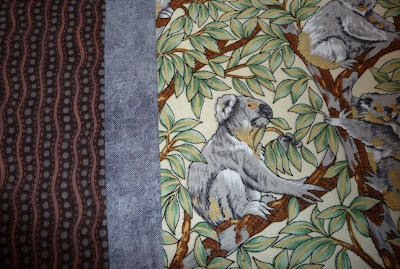 There's enough here for a baby quilt. Very bright and cheery. 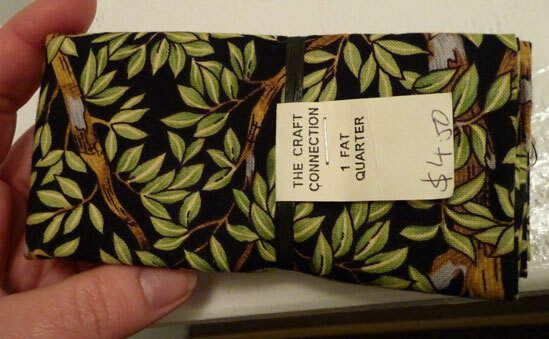 It's madness because there was only this fat quarter, nothing that really went with it. 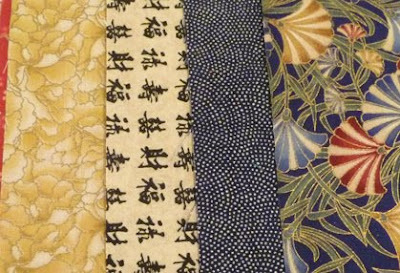 It's dangerous because you can BET that I'll find something to go with it... ...and the hunt for that coordinating fabric will, of course, lead to other bits that will attract me. OK. I've been holding out on you. I'd apologize but I'm sure you'd know that I'm not really sorry, just feeling a little guilty. I've been teasing friend Pauline about her huge stack of UFO's. But the truth is that I don't have much room to talk. My stash is growing, too. As a matter of fact, I've cleared out a large space in my linen closet just to store the batting and uncut fabric for projects that may not see daylight for some time. The picture (above) isn't terribly good. Have a look here at the picture on the "Patchwork with Gail B" website. 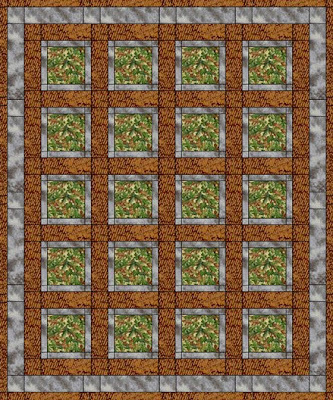 The design is gorgeous - simple rectangular "snowball" blocks. 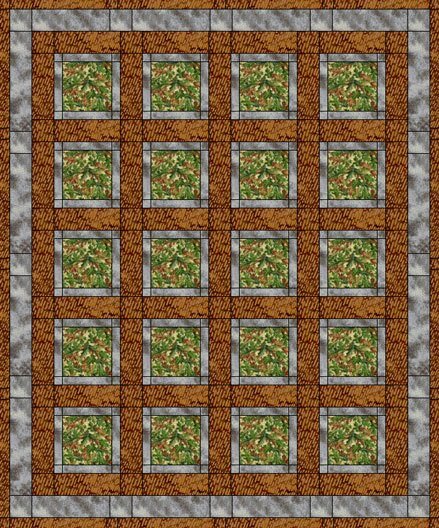 Each rectangular block has a small triangle of black on the corner which frames the block and creates a stained-glass window effect. 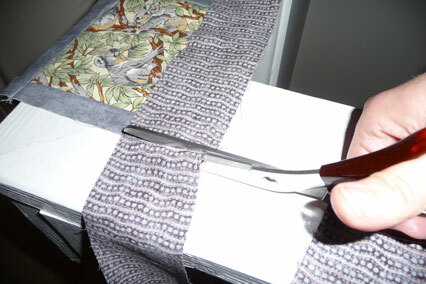 The simple black cotton runs around the edge, with matching binding. It's very dramatic. 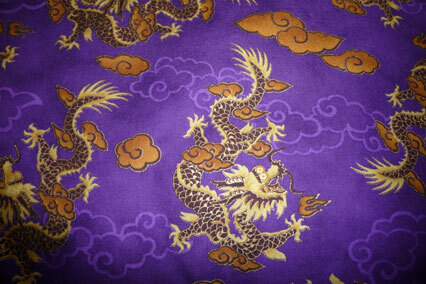 The photo doesn't show it well, but the dragons have sparkly gold on their feet, heads, and spine. The colours are just so rich. 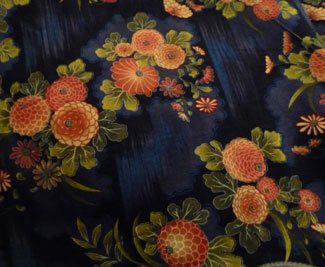 I bought a meter of this, not wanting to wait and then go back only to find that the fabric has sold out. 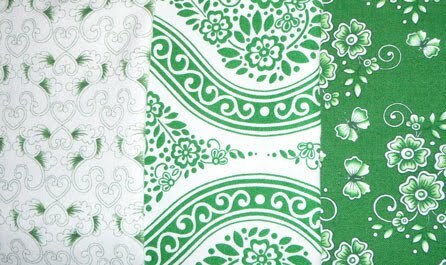 I'm sure I'll be able to find bits later that match and coordinate. In the meantime I'll see what kind of design I can come up with to maximize those glorious dragons. This print I've had for a little over a year. I bought 3 meters, thinking I'd make a summer garment for myself, but just never got around to it. Then a couple of weeks ago my friend Karleen showed me a small decorative quilt she'd bought - her quilt had some of this fabric in it! 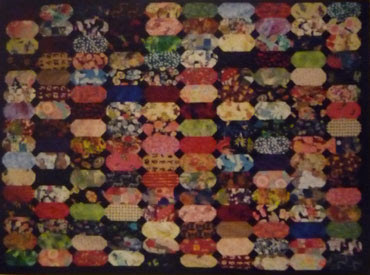 She said she wanted to make some pillows to go with it, and I offered her a meter of this (her pillows look simply gorgeous covered in this - really sets off the quilt!). So I've still got 2 meters, certainly plenty to for a quilt.